The town without walls is protected by its Lagoon, a sheet of water made of shallows, sandbanks, mudflats and a dense network of canals, which change depending on the height of tides. The Venetian Lagoon has always been a natural barrier against foreign enemies and a source of safety and wealth, because of its ports, canals and its islands. Venice was born in the heart of the Lagoon and it was called the Serenissima, the Dominant, the Queen of the Adriatic Sea. It is the capital of arts, a UNESCO World Heritage Site since 1987, “a majestic monument not of only one prince but of a whole nation” (Goethe, Italian Journey, 1816), a place rich in art masterpieces and fascinating panoramas. This unique town is a jewel that raises upon an archipelago of little islands, crossed by canals and connected by more than 400 bridges. Since the 11th century, Venice is divided into six districts (i.e. sestieri): Dorsoduro, Santa Croce, San Polo, San Marco, Cannaregio and Castello. Every district hides many precious treasures. Dorsoduro extends over the southern part of Venice, starting from Punta della Dogana and including Giudecca Island, Zattere and Santa Marta. There are several points of interest: Accademia Galleries, Peggy Guggenheim Collection, Punta della Dogana, Ca’ Rezzonico, Scuola Grande dei Carmini, Ca’ Foscari, Gesuati Church, San Trovaso Church, San Pantalon Church, Ognissanti Church, San Nicolò dei Mendicoli Church, San Trovaso Shipyard, Campo Santa Margherita, Ponte dei Pugni (Fists Bridge). Santa Croce is situated in the north-east of Venice and connects the town to the mainland thanks to Piazzale Roma. This district went through several changes over the centuries, starting in 1810 with the demolition of the Church and Monastery of Santa Croce, which gave their name to the district itself. The district includes Papadopoli Gardens, San Basilio and the Port of Venice. St. Mark’s district is the heart of Venice and it includes St. George’s Island too. Originally the sestiere was called “Rivoalto” and it was the early core of Venice and the oldest name of the town (Civitas Rivoalti). Here there is St. Mark’s Square, the only square of Venice, surrounded by Procuratie Buildings along the two longer sides. Here lie the Doge’s Palace and St. Mark’s Basilica, where the supposed St. Mark’s relics are enshrined. Cannaregio is one of the most populated district of Venice. 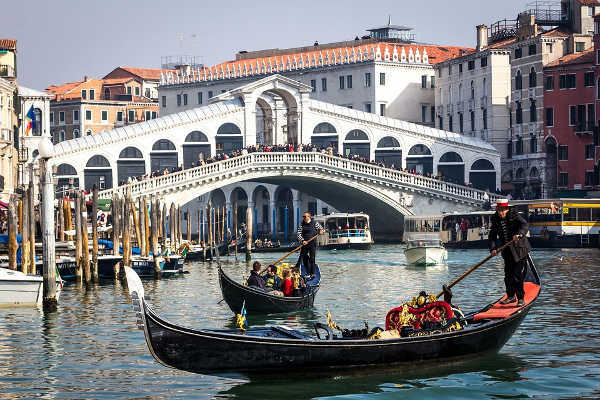 It developed on the northern side of Canal Grande. Here Venice Ghetto was born. Since 1509 Jews were restricted to this part of Cannaregio and in this Ghetto they built their beautiful “Schole” or synagogues. Santa Lucia Railway Station is Cannaregio building number 1. The Station was named Santa Lucia, because it was built in the area where Santa Lucia Church was demolished during the Napoleon Period. Castello is the most eastern district of Venice. The first inhabitants settled down probably in San Pietro Island, known as Olivolo, that was also the ancient religious core of Venice. The name of “Castello” derives from the existence of a fortress on this small island. The largest district of Venice includes the Arsenale, Venice Dockyard, the very shipbuilding industry of the town. Venice is not only history, art, breath-taking panoramas, but also a town that hosts traditional cultural events like the Biennale, a festival of art, dance, film and theatre, the symphonic season of the Theatre La Fenice, the Historical Regatta, the Festa del Redentore and the Carnival, one of the most beautiful in the world. Venice is a town to taste in every season.